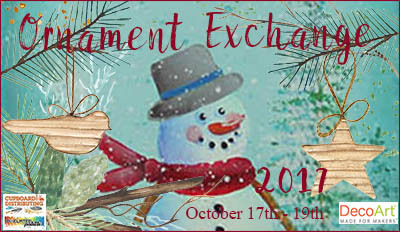 I am so excited to be a part of this Ornament Exchange Blog Hop with all these other amazing artist. I hope you will take the time to check out all of their wonderful projects. This is my project which I am calling Winter Wonderland. Can you feel the peace my snowy guy is feeling in the quite woods while the snow is gently falling and the moon is casting a warm glow. Basecoat your ornament Spa Blue. Transfer on pattern as needed. (A) Paint the trunk with Raw Sienna. Load small fan brush with Forest Green. Tap brush straight up and down on paper towel to remove excess paint and open hairs of brush. Start at top of tree with brush vertical and tap a few hair of brush to form top of tree. Turn brush horizontal and begin tapping a few hairs of the brush to form the top branch of the tree. Move down and tap a little wider. Continue down tree making branches wider. Reload brush as needed. (B) Load brush with Indian Turquoise tapping off excess and go lightly over tree allowing green to show through. (C) Then load brush with Warm White and using same method as above add snow to branches. Snowman: (A) Base snowman and ground with Warm White. (A) Float Indian Turquoise on back of head and down left side of body, (B) reinforce with Sapphire. Float Aqua Sky on right side of face and body. (C) Float Dioxazine Purple on lower left side of head and under chin and lower left side of body. Shade snow with same colors. Adding More Details: (A) Paint nose on snowman with Persimmon and eyes with Soft Black. Using small liner and thinned Sapphire paint line next to left side and under eyes, nose, mouth and buttons. Paint Warm White highlight in eyes and on nose. Paint on cheeks with thinned Spice Pink. Stroke on arms with Raw Sienna and scarf with Tomato Red. Shade scarf with Soft Black highlight with Warm White. Base hat with Slate Grey and band with Sapphire. Shade left side of hat with Soft Black and highlight right side with Grey Sky. Paint wreath with Raw Sienna, pine on wreath with Forest Green and bird with Sapphire. Paint Soft Black eye, highlight with Warm White and paint Raw Sienna beak. Working on the Jar: (A) Base lid with Grey Sky. Paint lines in lid with Slate Grey. Shade edges of lid with Slate Grey. Float down each side of jar and across bottom about 1/8″-1/4″ in from edge. This float should break here and there and should not be one large float. (B) Make a wide Desert Turquoise float around the edge of the jar. Float under rim of jar with Desert Turquoise. Tip for making wider floats: Dampen surface with water using ¾” wash brush. Float with 3/4” angle shader. If needed use mop brush to soften float. Pine on jar: (A) paint diagonal lines across twine with Tomato Red. Using liner and Forest Green stroke on pine. (B) Go over with Indian Turquoise and then (C) back over with Forest Green letting some of the under strokes show through. Shade twine with Slate Grey. Flyspeck with Warm White and Desert Turquoise. Remove any transfer lines, varnish and attach desired hanger. DecoArt is providing the DecoArt product used in this project to one lucky winner. To enter to be a part of this giveaway comment on this blog post. I will select the winner on November 3rd. Each artist in this blog hop will also be offering the DecoArt Give Away so check thier amazing ornaments using the links below. I hope you are enjoying this Blog Hop and are inspired to paint some ornaments for family and friends. Please share your creations with us on FaceBook. A Very Special Thank you to DecoArt and Cupboard Distributing for sponsoring our blog hop. This is so cute. I love this snowman ornament. I love this idea. I’m so excited to paint these!!! This is so cute. I’m anxious to paint the snowman. Thank you for the project. I love Mason Jars for lots of things so I love this ornament! thank you for sharing your pattern! A snowman and mason jar are a perfect combination! I love this ornament and thanks for the instructions! Thank you for sharing this with us! Love anything on old timey type surfaces — it reminds me of my grandparents. Can’t remember if I already commented or not, so just in case I didn’t I love your palette. G reat Can’t wait to paint and share! base coat your ornament. He is so cute! Love, love all of the ornaments! Can’t wait to get started.